An old or elderly person is one who is 65 years and above. As one advances in age, the cells and tissues of the body start losing their youth, hence the wrinkles and grey hair that we associate with old age. But beyond the wrinkles and grey hair, within the body, the tissues and organs undergo gradual changes; this makes them prone to environmental or genetic conditions which they were a bit immune to during the young and middle age periods. 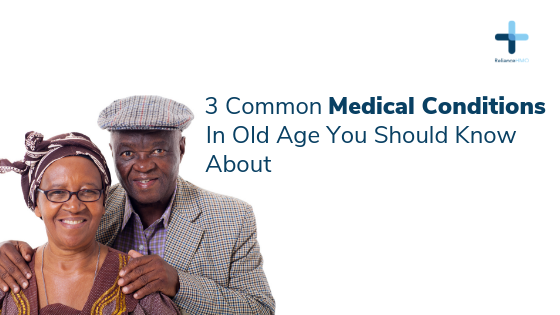 As a result, it becomes easier to develop certain medical conditions in old age compared to the young or the middle age periods. In addition, unhealthy lifestyle such as smoking, excessive alcohol intake, heavy salt intake and unhealthy eating habits, which one had in one’s youth and middle age and whose effects on the body accumulated over the years but didn’t cause any problems then, now begins to manifest in old age because of the body’s weakened ability to fight them off. Arthritis is a bone condition that affects many people in old age. It is a condition in which the immune cells and chemicals passing through the bone joints in the body, more especially the knee joints, periodically attack the tissues of the joints in the process of fighting off potentially harmful agents or physically induced stress in the joints. For many old people, arthritis is a result of many years of excessive physical use of their bones, for example, walking very long distances wearing high-heeled shoes almost on a daily basis. For young people, the key to reducing the risk of arthritis in old age starts now. Women shouldn’t wear high-heeled shoes for long periods. They can wear them for those important occasions, and change to flat shoes once the event is over. On the other hand, research studies have linked obesity with arthritis in the knee in old age, so young and middle-aged people should ensure maintaining their weight within the healthy range for a pain-free old age. Many people develop one form of visual problem or the other as they get older. Commonest eye medical conditions in old age are those associated with blindness. An example is cataract. Cataract is one of the commonest causes of preventable blindness in old age, and it results from gradual but progressive thickening of the eye lens (the small, round black or brown thing at the centre of the black portion of the eye). This thickening gradually affects the person’s ability to see and can result in total blindness in the person. Cataract in old age has been associated with conditions like hypertension, diabetes, chronic alcohol consumption and prolonged (many years) exposure to the ultraviolet radiation of the sun. But the good news is cataract in old age and the blindness it causes can be reversed with surgical treatment. If you have a family relative or know anyone who is old and became blind after months of complaining of poor eyesight, it might be cataract. Such a person should be taken to a teaching hospital to see medical specialists known as ophthalmologists. Teaching hospitals like UCH Ibadan perform cataract removal surgeries in old people about 3 times a week and these patients regain their sight after the treatment. When people get to their late 60s and upwards, many of them begin to develop varying degrees of hearing impairment. The most common symptom of ear problems in old age is the perception of a ringing sensation in the ear (known as tinnitus). Hearing loss in old age has been attributed to long-term exposure to loud noises, for example, if the affected person worked in a heavy machinery factory for many years and never or rarely made use of sound mufflers to protect his or her ears. Hearing loss can be treated medically or surgically depending on the underlying cause. Most of the time affected persons may be given hearing aids before or after the major treatment as part of supportive management. Young people working in heavy machinery factories should always take occupational safety measures (wearing sound mufflers) to protect their ears. In addition, always avoid prolonged exposure to very loud noises in places like night clubs or concerts, and ensure your headset or earpiece is within the healthy range for sound when blasting your music.